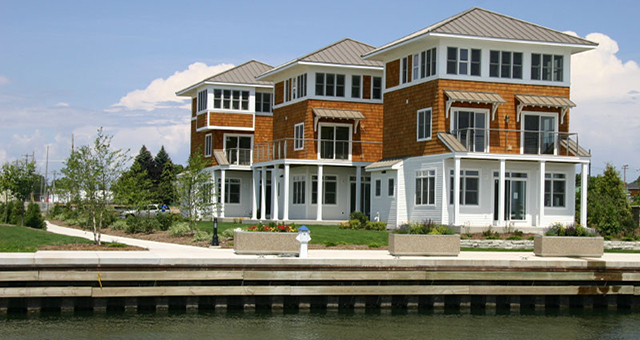 The Marina Cottages at The Shipyard are unique 1,600 square-foot homes designed in the classic coastal cottage style with a contemporary twist. Enjoy full use of CenterPointe Marinas clubhouse, indoor/outdoor pool facilities, grilling stations, and outdoor fireplace. The private clubhouse includes a 2,000-square-foot lounge on the second floor that can be used for private parties or corporate meetings. The three identical cottages situated on the property create an ideal opportunity for large family gatherings and corporate retreats; up to 18+ people using all three cottages or simply a quiet weekend get away.